Blown Driver? Need a replacement Leslie driver ? Or in my case wanting to use my vintage Leslie more and more, harder and harder with the confidence that it won’t degrade or let me down altogether? It’s a difficult one as you shouldn’t really run your Leslie on 10 for long as the driver can get hot and pop. Trouble is if you play in a live band like I do those measly 40watts are all you’ve got and you have to make the most of them. I’ve been making some enquiries on how to upgrade the driver recently and thought I would quickly share my knowledge. there are many options but for now I’ll just say that if you need a replacement for you Jenson V21 a couple of options are open and couple are closed. Closed is to think you can use the one in the current Leslie 3300. Its a good idea however wrong ohms. 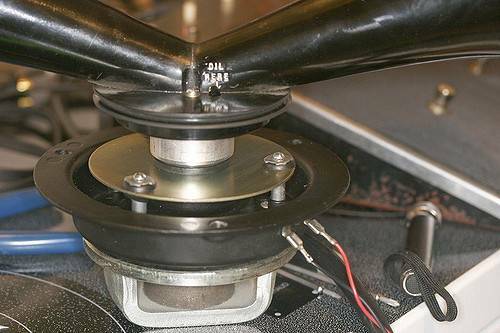 A good straight replacement is the Altas-PD5VH driver. A better replacement would be the Atlas-PD60A (both available from those wonderful people at Tonewheel General.) Trouble is if you are based in Europe as I am the delivery charge and tax is off-putting to say the least. There are a couple of other choices, the PA-D50Z that was standard spec in the Leslie 2101 Mark 1 is reported to fit okay into an old school Leslie and the Adastra 952.210 or Monacor KU-516’s will fit in (with minor adjustment and the addition of a bit of wood to account for the lack of threaded throat). The M&S organ parts kits is recommended too but looks to be out of production currently.